Prof. Keiichi Ogawa delivered a lecture at the international conference on “Poverty Reduction in Asia & Africa”, held on Friday 23rd May 2014. The conference was organized by Educators Without Borders (EWB), a Non-Government Organization (NGO) and Seoul National University (SNU), South Korea. It was divided into two sessions, corresponding to the two regions highlighted in the conference theme (Asian region and African region). Presentations in the Asian session focused on poverty reduction through the development of rural areas and farmers’ trainings, with the Philippines and Cambodia as case studies. The African session presentations discussed the significance of poverty reduction through the development of education and health sectors, referencing Burkina Faso and Kenya as study areas. Prof. Ogawa presented in the final session, and he began his presentation by summarizing previous presentations, and then followed by his personal comments and opinions. He highlighted some international organizations currently working in the field of education development. In addition, he shared information about a project evaluation method being used by the Development Assistance Committee (DAC) in the Organization for Economic Cooperation and Development (OECD). 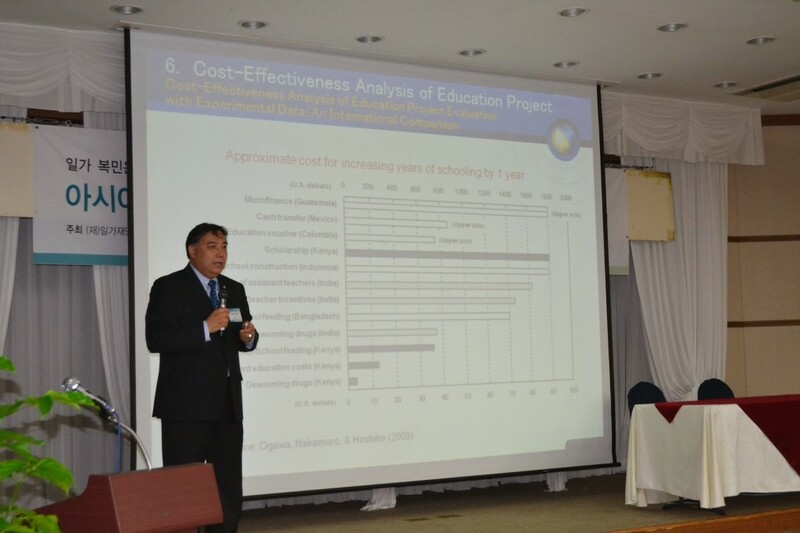 Furthermore, Prof. Keiichi Ogawa talked about cost effectiveness analysis of education development projects, education development works by international organizations and the importance of effective investment in education sector. Through this conference, participants were able to learn about real/ practical situations in some developing countries and the various approaches to poverty reduction using ongoing projects. Participants were particularly impressed by GAPA project in Burkina Faso which is being implementing by EWB. The project is steadily contributing towards the promotion of women empowerment and poverty reduction in rural areas through microfinance, literacy and health education. Special gratitude goes to Dr. Ki-seok “Korbil” Kim, a Professor Emeritus at SNU and Chief Executive Officer (CEO) of EWB, for successfully organizing and hosting the conference.